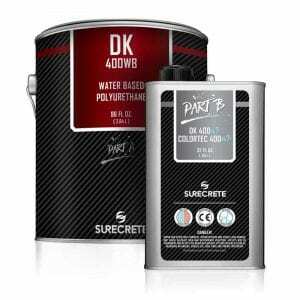 SureCrete’s HS 200 Series is a premium exterior Silane Based clear stamped concrete sealer for durable protection on driveways and pool decks as well as high traffic walkways and sidewalks. HS 200 Series is a 20% Solids silane-based acrylic sealer that is available in a low-VOC formula. HS 200 is one of the best Penetrating Concrete Sealers on the market today. HS 200 Series is Surecrete’s most advanced premium quality concrete sealer, solvent-based silane acrylic sealer. HS 200 Series is a premium exterior clear stamped concrete sealer that is designed for exterior concrete applications that need attributes such as: slower evaporating solvents, efflorescence reducers, crystal clear finish, and can protect against freeze-thaw elements. HS 200 Series is ideal for vehicular areas such as driveways, golf cart paths, and other areas where a high gloss clear durable sealer is required. It can also be used in heavy foot traffic surfaces such as walkways, sidewalks, and porticos. HS 200 Series is available in a standard 600 g/L and a low VOC 400g/L version. 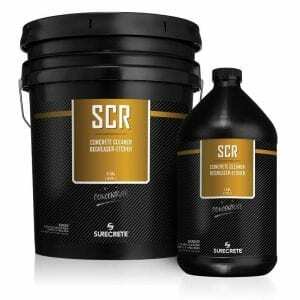 When you choose this premium concrete sealer, you will notice the difference immediately. The slower evaporating solvents help to give the applicator more time to apply before it becomes tacky and begins to create “spider webs”. This is essential as temperatures are getting warmer every year. The silane used helps reduce efflorescence, by managing moisture migration. It also delivers additional protection, when the acrylic film wears down over time. 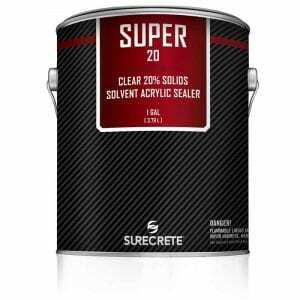 HS 200 uses the highest quality acrylics to give a crystal clear, gloss finish on all exterior concrete surfaces. 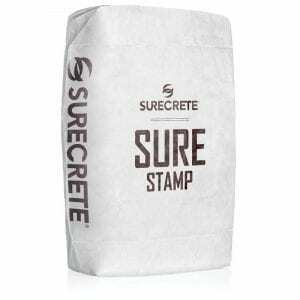 How Do You Apply SureCrete’s Premium Exterior Clear Stamped Concrete Sealer Silane HS 200 Series? Make sure that temperatures will remain between 50 and 90 degrees Fahrenheit and there will be no precipitation in the applied areas for a 24 hour period following application. HS 200 Series Premium Acrylic Sealer can be applied by roller, airless sprayer or pump-up sprayer. Whatever your application technique, make sure to apply thin, even coats over your surface. Two coats are typically suggested with any exterior project receiving a clear acrylic sealer, with the second coat being applied as soon as the first coat can be walked on, and is used in the same manner as the first layer. Question: Can I use just one coat of HS 200 Series Clear Stamped Concrete Sealer? Answer: Yes, however, it is not suggested. For the best results, we highly recommend using two thinly applied coats. That being said, HS 200 Series products have been known to function better than comparable sealers in situations where a single-coat exterior acrylic sealer is required. Question: Will HS 200 Series Clear Stamped Concrete Sealer fill small holes? Answer: No, clear acrylic concrete sealer products were not designed to fill small holes or voids. Caution should be given to puddling with HS 200 Series, as it is intended to be crystal clear when the product is 8-9 mils wet applied. 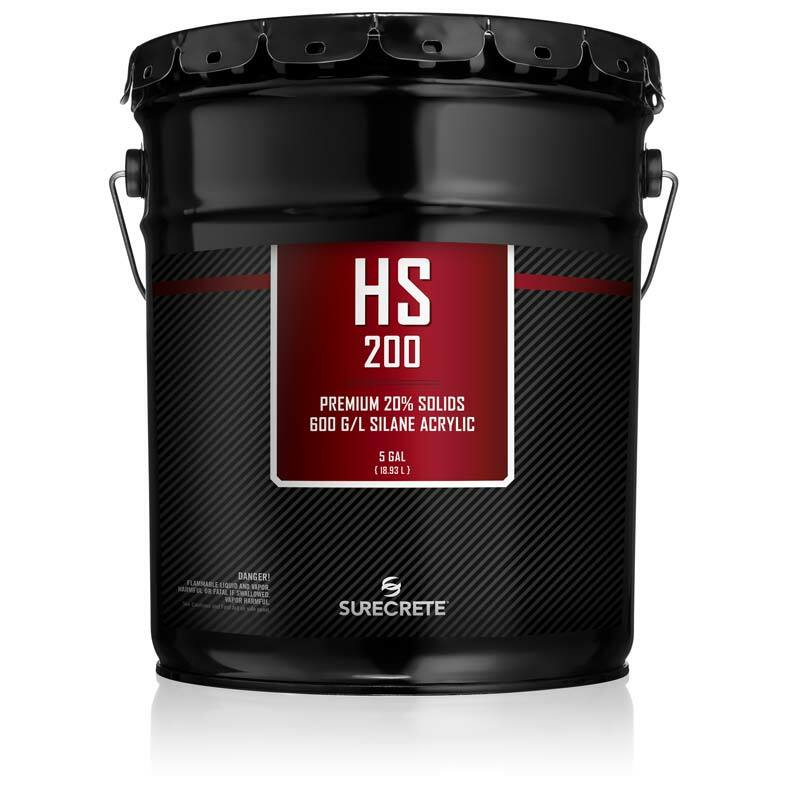 SureCrete’s HS 200LV is a premium,high-performance, single-component, 20% acrylic solids, low VOC (400 grams per liter), sealer designed for concrete or any cement based product. As with most acrylics it is vapor permeable and readily applies outside. However, HS 240 is specially formulated for extreme climates where a low VOC sealer is required. Its nano-sealer technology deeply penetrates and reacts internally with cement, slowing moisture migration and efflorescence and intensifying bond capacity. Even in warmer climates HS 240’s slower evaporating solvents will not apply a cotton candy effect before the applicator can finish a tight, smooth surface. A single coat application will provide a UV shield, enhance the beauty, and protect the surface of driveways, garage floors, patios, walkways, pool decks, and stucco. HS 200LV was specially designed to meet the challenges posed by some of the harshest freeze/thaw cycle climates in the world. In these difficult to deal with climates, many applicators and DIY weekend warriors alike have elected to forego sealing new concrete substrates, driveways and sidewalks altogether because of the excessively high de-lamination and subsequent failure rate associated with typical exterior acrylic sealers in these areas. Since many of the areas that deal with these problems also adhere to a stricter statute of solvents or VOC laws, we formulated HS 200LV to be give these contractors and homeowners a sealer that could not only help protect and strengthen their freshly poured concrete driveways and walkways, but also anage to do so while adhering to local VOC laws. Easy to purchase from over 100 stores in the United States. SureCrete’s HS 200 is a premium is a single-component clear acrylic sealer, 20% acrylic solids, 600 g/l, sealer designed for concrete or any cement based product. 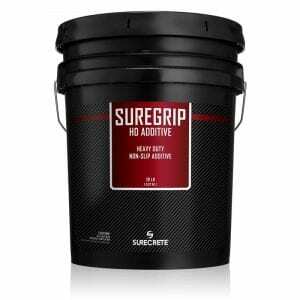 As with most acrylics, it is vapor permeable and readily applies outside. However, HS 260 is specially formulated for extreme climates. 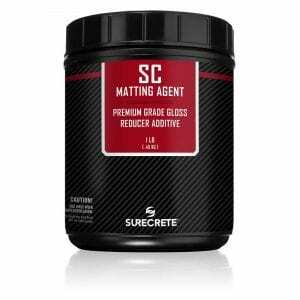 Its nano-sealer technology deeply penetrates and reacts internally with cement, slowing moisture migration and efflorescence and intensifying bond capacity. Even in warmer climates, HS 200’s slower evaporating solvents will not show a cotton candy effect before the applicator can finish a tight, smooth surface. A single coat application will provide a UV shield, enhance the beauty, and protect the surface of driveways, garage floors, patios, walkways, pool decks, and stucco. HS 200 was specially formulated to deal with climates in which freeze/thaw cycles are a common occurrence. In these harsh environmental conditions, the majority of homeowners and contractors alike have steered many exterior concrete applications away from acrylic sealers and coatings over top of freshly poured flatwork or tightly troweled overlays or stamped concrete due to their incredibly high failure rates. HS 260 is one of the many sealers in the HS Series line that was specially designed to combat this very issue. By penetrating further into the surface of the concrete substrate and partially solidifying in a similar fashion to our LD1800 lithium densifier product, HS 260 actually makes your new concrete driveway or sidewalk stronger than it ever could have been on its own. Due to unique properties, slabs and new substrates installed utilizing HS 260 as a protective coating last much longer than would normally be possible. SureCrete’s HS 200 Series is a premium exterior Silane Based clear stamped concrete sealer for durable protection on driveways and pool decks as well as high traffic walkways and sidewalks. 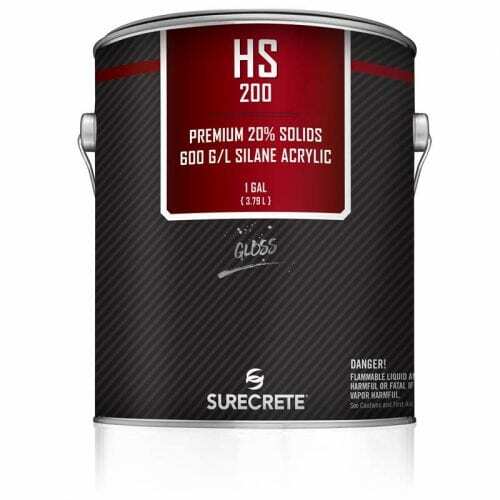 HS 200 Series is a 20% Solids silane based acrylic sealer that is available in a low-VOC formula.